Microsoft is giving IT administrators a glimpse of the future with two betas the company launched Monday. SharePoint Server 2016 is the latest version of Microsoft's popular team collaboration software, and the just-released beta is designed to give IT administrators an early portrait of what's coming when Microsoft releases its official update next year. Key features for SharePoint 2016 include support for large files up to 10GB in size and a new App Launcher that makes it easier for users to open applications from the navigation bar inside SharePoint. Microsoft has also simplified the controls for sharing files. The release is also focused on improving the experience for smartphone and tablet users with controls that better support using touch to get around SharePoint sites. Fair warning to early adopters: Microsoft recommends that users not install the beta of SharePoint Server 2016 in a production environment. In part, that's because it's not possible to directly upgrade from the beta to the final version of the software when it's released next year. 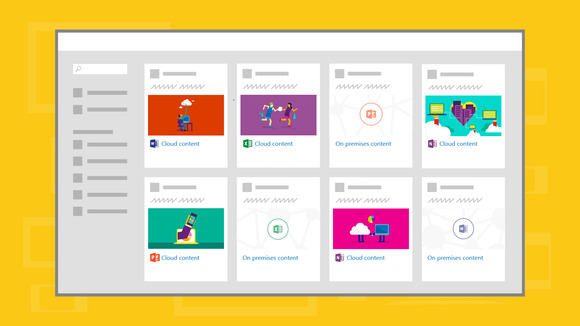 On top of the SharePoint beta, Microsoft's new cloud hybrid search feature will allow Office 365 users who also run on-premises SharePoint servers to easily access both the files stored in their company's servers as well as those stored in Microsoft's cloud. This means that Microsoft Delve, which gives users an at-a-glance view of their team members' work, can show files that are stored in a company's servers and in Microsoft's servers side by side. Indexing for cloud hybrid search is handled in Office 365, which means users can reduce the amount of work their servers do around creating and maintaining search indices. These new features highlight one of the key focuses of Microsoft's cloud strategy. While the company is encouraging organizations to switch to Office 365, it's also continuing to support products oriented towards businesses that want to maintain on-premises servers. The cloud hybrid search beta is available as an opt-in feature for companies that use SharePoint 2013 or SharePoint 2016, in addition to Office 365. Users can set up cloud hybrid search now on their on-premises SharePoint servers, but they can't configure it for use with Office 365 until early September.